A few weeks ago, I celebrated my birthday. I could be defined as ‘middle aged’ now. I'm quite certain I’m living to one hundred and ten (so not quite middle aged yet). There are a few observations I have made along the way – observations that I set out to share with you weekly. This week I’d like to share an observation that I made in my late thirties and that has continued to serve me well. Earlier in my journey I had the mindset that when I graduated from high school things would be different and happiness would follow. When I graduated from college, things would be different, and a sense of fulfillment would follow. When I got married, had children, ‘settled’ down, things would be different, and I’d live in place reminiscent of a sanguine Hollywood movie. You get the picture. Indeed, things are different – different place, different career, different responsibilities than I had at 18 years old, or at 25, or 35, or even 45. I now have a husband, children, a home, pets, responsibilities. I have found that my thoughts of obtaining ‘things’ or relationships; a car, a home, a husband, children have not created happiness, fulfillment, a picture-perfect life, in and of themselves. Throughout my life, throughout all my successes, adventures, trials and tribulations, there has remained one constant. I am ever present and absolutely everything that happens around me, to me, or because of me, is filtered through my entire life time of experiences, of memories, of interactions with family, friends, strangers. 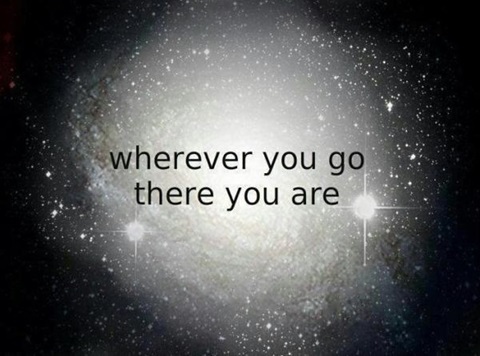 “Wherever I go – there I am”. Indeed. I believe we have all thought about ‘getting away from it all’ at one time or another. Social media is filled with posts about it being ‘beach time’ or ‘vacation time’ or ‘it’s five o’clock somewhere’. Vacation get-a-ways, whether they be for a few days or longer can be refreshing, renewing, revitalizing to our spirits. It is nice to think about leaving “it” all behind for a bit. What causes concern is when we begin to consider leaving it all behind on a more permanent basis. When moving, job changes, partner changes start to look like good ideas - reflection must be had. We need to ask ourselves first and foremost “Why?”. Why am I looking to uproot and move? Why isn’t my job satisfying? Why am I dissatisfied with my relationship? Relocating to a different place sounds like a grand adventure. New space, new stuff, new you? Unfortunately, no, not a new you. Same you. Different zip code. A new job sounds delightful. Starting fresh! Maybe a career change! Unless you can objectively look at what didn’t work at your last place of employment – you will be taking you – and all stuff that comes with you – just to a different location to work. Falling in love (or lust) gives us humans such a ‘high’… our egos love attention and admiration. We have all heard of marriages breaking down because of one partner complaining that they are not appreciated by the other. Who doesn’t remember the butterflies in the pit of your stomach when asking someone out or accepting an invite to dinner? When you are in the midst of a twenty-year marriage a little attention from someone new can make you consider leaving – a ‘do-over’ and ‘chance to get it right’ with someone that ‘gets you’. Guess what? You are still you and after the 'newness' wears off – you will revert back to the pattern that you had with the woman or man you were married to for twenty years. Unless you do the work – you do not change. We cannot run from ourselves. Responsibilities, large and small, remain wherever we find ourselves…and we remain…an ever-constant companion on our journey throughout life. How we view our life, how we process our experiences, how we act and react is all based upon who we are. Unless we are willing to do the work that it requires to change our patterns of behavior – there is no ‘vacation’ to be had. No ‘starting again’ or “do-over’ will ever change who you are at your core. What we can do - is to begin to LIVE IN THIS VERY MOMENT!! Right here - as you are reading this article! Become aware of yourself, your surroundings, the sights and sounds around you, the temperature of the air. Be so completely in the moment and aware - and then – offer thanks – you are here – breathing – alive! You are obviously reading this on either a computer/tablet or phone – kudos for you for having that device – and internet! Are you comfortable? Give thanks! Sit in gratitude – really dig in – be silly – be thankful for your socks – your shoes! The sun, the rain, the quiet, the noise… just sit in gratitude. Go on – become aware of your breath - close your eyes – and offer thanks - remain there for a few moments…. Quieting your mind – allows you to just be in the here and now…that is all we really have. 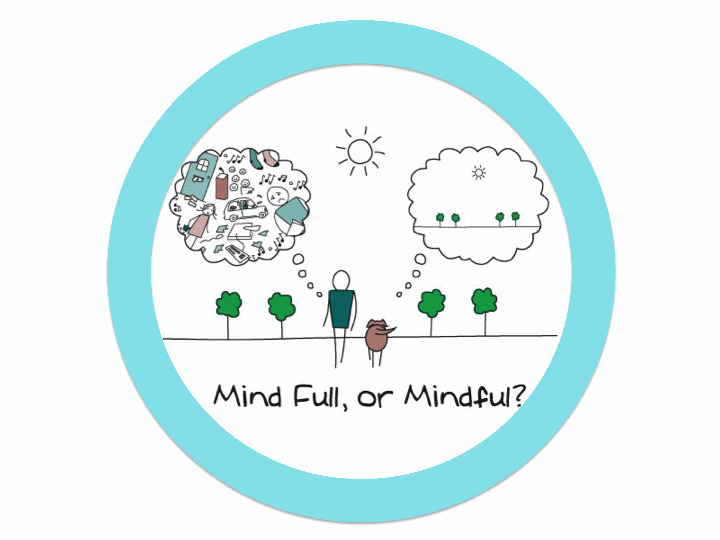 (The current trendy word being “mindfulness”) . If we get obsessive about what could happen, how people could react, what we are going to say, what we are going to do, we never truly experience the now. My happiness never came from where I thought it would – in obtaining goals – sure I experienced satisfaction of jobs well done – but that was fleeting. Think of how many people you have had interactions with that have had the goal of losing weight for an event... to only gain it back after the occasion had passed because the cause of the overeating was not addressed. Sure, they looked good for their wedding, class reunion, etc., but the underlying reason for their condition was never resolved. My happiness has come from the most unexpected places. A boat ride with a dear friend on a perfect summer day, my Son giving me a spontaneous hug (he is a teenager – you get it), a walk at dusk with my youngest child, a dance with my Husband. These are the moments of our lives. The moments to treasure. Stop chasing what you believe is finally going to bring you your bliss. In my mind, bliss cannot be sought after – it develops organically. Live in the here and now – and begin to tackle your underlying reasons…your hidden motivations…. what drives you. When you are right with you then you are able to move, to change, to become different. The most difficult of journeys is inward towards self-reflection. Honest, objective self-reflection allows us to stop chasing what is ‘out there’ (something that may bring us happiness for a moment).